The Char Broil grill is one of the best known producers of outdoor grills and grilling-related products. This is a reliable producer with a reliable line of both gas and charcoal grills. Here I will tell you a bit about the charcoal CharBroil grill options. Overall, I like this line of charcoal grills very much. They are very different in styling from the other close competitor in charcoal grills, the Weber charcoal grill. For one, they do not have the typical Weber kettle shape. Instead the Char Broil grill is a rectangular charcoal grill, allowing for quite a bit bigger total cooking surface area. Additionally, these grills generally include an adjustable charcoal grate for versatility and heat adjustment as well as a charcoal access door for easy tending to your coal to add briquets or move your heat source around while cooking. Rugged, heavy-duty steel body with weather-resistant powder coated finish - These are very rugged and last a long time if well cared for. Built in hood thermometer - All the Char Broil grills have a built in thermometer to check that your cooking temperature is adequate and not too hot or cool. 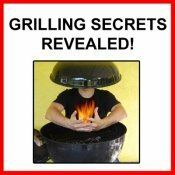 Adjustable charcoal grate - This allows your to raise or lower your charcoal to get it closer or further from your food to adjust the amount of direct high heat it gets. Charcoal access door - This is very handy for easily accessing your charcoal even once you've started cooking. You can move the coals or add coals as needed. Many other charcoal grills do not have this feature found on the Char Broil grill. Large working area - The large rectangular grill grate gives you ample space to cook all your foods at the same time for a big party. This particularly true for the CB940X and Santa Fe models. They are quite a bit bigger than the major competitor, the Weber 22-1/2" kettle grill. The large size is particularly useful for indirect heat grill since you have ample room to have two large piles of coal on either side with abundant space in the middle for your roasting meat or poultry. Optional Rotisserie - Char-Broil has recently introduced an optional motorized rotisserie which fits most of their grills and can be attached to these charcoal grills. Large size - These are not very "portable" grills. Although they have wheels for easy moving in your backyard, they cannot be easily moved long distances. Also, because the interior of the grill is large, these grills require quite a large amount of charcoal to get the whole cooking area up to cooking heat. This is fine if you plan to regularly cook for large groups of people or have a big appetite. 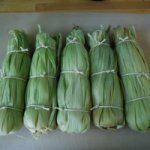 However, if you are cooking for one or two, you will waste a large amount of charcoal in each cooking session. Santa Fe - The Santa Fe is Char-Broil's entry-level grill but it is far from just a "beginner's" grill. This is a serious grill capable of heavy-duty barbecue action! The Santa Fe, pictured above and here, comes standard with a heat indicator built into the grill hood, wheeled legs for easy moving, an adjustable charcoal grate, a charcoal access door, two side tables for holding food, supplies and condiments. It also has a metal lower rack for storing your charcoal, charcoal chimney starter or other supplies. Four variable dampers (two on the hood and two on the charcoal area) allow control of oxygen input for temperature control. The easy-clean porcelain cooking grate has a whooping 491 square inches of cooking surface. This Char Broil grill is a sturdy grill and a good all-purpose option for all your grilling needs. CB860X - This is a slightly smaller Char Broil grill with 384 square-inches of cooking surface. However, in addition to the basic features of the Santa Fe, it offers some advantages over the Santa Fee charcoal grill. This grill has pre-seasoned cast iron grates. Its side shelves are removable and double as prep, carving and serving boards. It also incorporates a slide-out ash pan for easy clean up and a solid metal lower storage rack. It has wheels on all four legs, making mobility even easier. It has slight more rugged overall construction and is a nicely refined charcoal grill. CB940X - This grill has all of the same great features of the CB860X but is quite a bit bigger. If size matters to you, then this is a great charcoal grill for you! It has a huge 540 square-inch cooking surface of pre-seasoned cast iron grates. Offset Smokers - Char-Broil also has a line of combination grill smokers. The all include an offset smoker firebox which allows for a variety of cooking styles including basic charcoal grill cooking as well as offset smoker cooking. They all have a separate offset firebox which has its own door for tending your fire. The have chimneys with a variable damper. 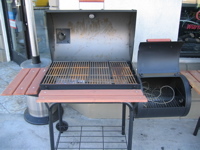 The smaller model is the American Gourmet Smoker, BBQ, and Grill. It has 244 sq. in. of cooking surface area. The Silver Smoker, BBQ, and Grill (pictured) and the Double-Door Smoker, BBQ, and Grill both have huge 738 sq. in. cooking surfaces. The Double-Door Smoker has smaller separate doors to minimize smoke loss when smoking foods to retain heat and flavor. It has a removable ash drawer, cast-iron porcelain-coated grates and a heavy-gauge steel construction. It also includes a bonus veggie rack and water marinade pan which is not included with other models. These are all very versatile smoker/BBQ/grills which allow you to cook in several different styles. 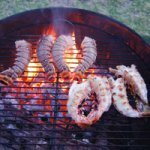 I hope this helps you decide if a charcoal Char Broil grill is right for you and all your grilling need! 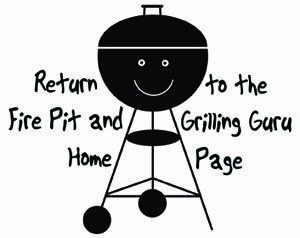 Char-Broil also has a line of gas grills and other grill related accessories to check out. go back to our outdoor grill types page.